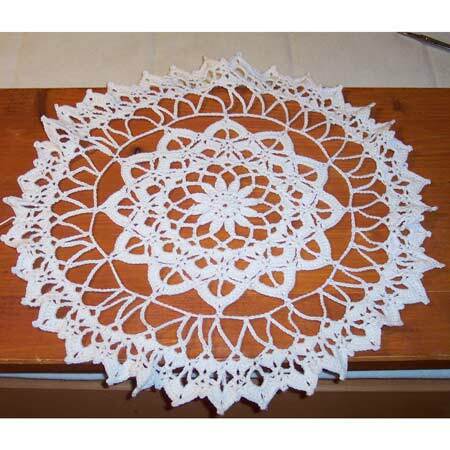 Comments: This doily is very eye-catching, but it is really simple (for being a doily..) and fast to finish, using a thick thread like that used in the example. Try it also with a #12 thread to have a more delicate look. Material: Pearl cotton # 5 , hook 1.7 mm (US steel 8 #); you can substitute with Cebelia #10 or equivalent ecosse or cordonnet thread (but the gauge can slightly vary); Please visit my Virtual Store id you need materials. Picot = 3 ch, sc in first ch. 1. 12 dc in lp, join with sl st to first st.
2. (6 ch, sl st in second ch from hk, sc in third ch, hdc in 4th ch, dc in 5th and 6th ch) = petal done, sl st in next sc, start next petal from same dc. 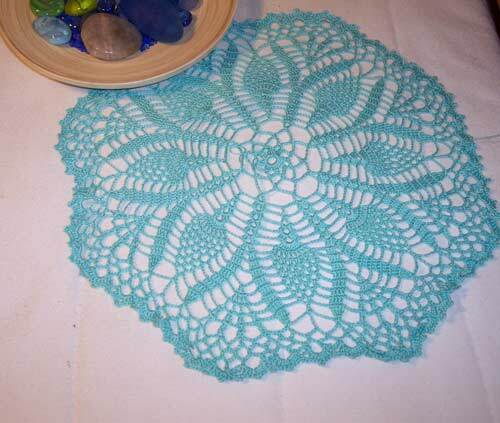 Make 12 petals, join with sl st. Cut thread. 3. Join thread in tip of a petal (the free chain on top), [sc in tip of next petal, 7 ch]*. Repeat * to * 12 times, join with sl st to first st.
4. [(dc, 3 ch, dc) in 4th ch of next lp, 3 ch]*. Repeat * to * 12 times, join with sl st to first st.
5. [(dc, 3 ch, dc) in 4th ch of next lp, 3 ch]*. Repeat * to * 12 times, join with sl st to first st.
6. [(3 dc, 2 ch, 3 dc) in next 3-ch, sp, (sc, 3 ch, sc) in next 3 -ch sp]*. Repeat * to * 12 times, join with sl st to first st.
7. [(hdc, 2 ch, hdc) in next 2-ch sp, (tr, 5 ch, tr) in next 3 -ch sp]*. Repeat * to * 12 times, join with sl st to first st.
8. [(sc, 3 ch, sc) in next 2-ch sp, (5 dc, 2 ch, 5 dc) in next 5-ch sp]*. Repeat * to * 12 times, join with sl st to first st.
9. [(tr, 5 ch, dtr, 5 ch, tr) in next 3-ch sp, sc in next 2-ch sp]*. Repeat * to * 12 times, join with sl st to first st.
10. [7 dc in next 5 ch sp, vst in next tr, 7 dc in next 5 ch sp, sc on next sc]*. Repeat * to * 12 times, join with sl st to first st.
11. [sc in next vst sp, 14 ch]*. Repeat * to * 12 times, join with sl st to first st.
12. [sc in next sc, 15 ch, (sc in next sp, 15 ch) twice]*. Repeat * to * 12 times, join with sl st to first st.
13. [vst in 8th ch of next sp, 5 ch]*. Repeat * to * 36 times, join with sl st to first st.
14. [(3 dc, 2 ch, 3 dc) in next vst sp, (sc, 3 ch, sc) in next 5-ch sp]*. Repeat * to * 36 times, join with sl st to first st.
15. [(hdc, 3 ch, hdc) in next 2-ch sp, 1 ch, (dtr, 5 ch, dtr) in next 3-ch sp, 1 ch]*. Repeat * to * 36 times, join with sl st to first st.
16. [(sc, 3 ch,sc) in next 3ch sp, (5 dc, 2 ch, 5 dc) in next 5-ch sp]*. Repeat * to * 36 times, join with sl st to first st. 17. [(sc, picot,sc) in next 3-ch sp, (sc on next dc)5 times, (sc, picot,sc) in next 2-ch sp, (sc on next dc)5 times]*. Repeat * to * 36 times, join with sl st to first st. Cut thread.